As a financial advisor, I learn a lot about clients' short and long-term financial goals through many conversations and building relationships with them. I also often learn about their frustrations and regrets regarding past financial decisions. During these conversations about financial regrets, I often remind clients that it is important to remember that with time comes perspective and experience. So while they, as adults, may have regrets about past financial blunders, they can use their knowledge and experience to help their children steer clear of the same mistakes. 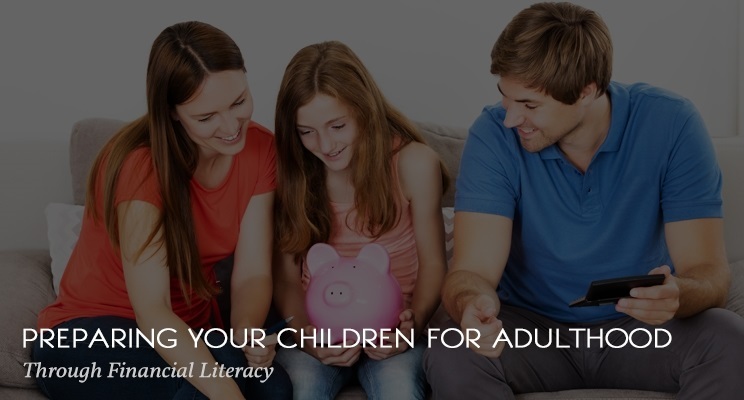 With April being Financial Literacy Month, there is no better time to learn about the importance of teaching children about financial matters and helping them form good habits. Are you hesitant to speak with your children about financial matters because of how you've handled past situations? Well, you aren't alone. Many parents are reluctant to speak with their kids about finance but haven't considered using their personal experiences as a lesson to teach their kids about financial consequences. While some parents think their child will learn financial literacy in school, only 17 states in America currently require students to take a personal finance course. If children aren't learning about money from their parents and/or guardian, many children are left in the dark or could learn negative financial habits from their peers or media. Broach the financial conversation with your children knowing you don't have to be a financial genius in order to teach them helpful lessons for the future. Sometimes these conversations even help parents take better control of their own financial situation, in order to be a strong role model for their children. 1. Earning Money. One of the first experiences your child will have when it comes to financial matters is earning money. Whether you are offering a small stipend for jobs around the home or your child has a part-time job after school, earning money through physical or mental effort helps your child associate value to labor. 2. The Importance of Budgeting. The topic of budgeting can be brought up at a relatively early age. Whether your child earns an allowance or is paid from a job outside of the home, discuss how he or she can create a budget with the earnings. Some parents require the income a child earns to be used for their discretionary spending - things like gas, going out with friends, or buying a new clothing item. Be sure to help your child create a system where a portion of his or her money will go into savings, an emergency fund, their car or phone payment, etc. Budgeting helps children learn the value of money and gain a clearer picture of the time and effort involved in obtaining something of value or make a major purchase in the future. 3. Saving Money. It seems like such a simple topic yet saving money is often not discussed with younger generations. As young men and women between the ages of 17 and 25 make plans to move away from the family home, many are unprepared for the shock of monthly bills and being tied to contractual obligations, such as rent, phone, and monthly car payment contracts. By having a firm grasp on saving money and budgeting ahead of time, your child can bypass "bill shock", in addition to feelings of anxiety and confusion when he or she moves out of the home. You can teach younger children about the topic of saving money through the use of a piggy bank, and older children through opening a savings accounts and setting up various goals. 4. The Difference of Needs vs. Wants. Because we live in a want-driven society, this is a crucial discussion to have with your child. We "need" food, shelter, clothing and security to survive - whereas our "want" is something we desire but do not depend on to live. Teach your child that "needs" should be built into their budget, whereas a splurge or extra money fund is what should be paying for the "wants" in life. Of course, this can segue into a much broader discussion of why your child wants something - possibly because his or her friends have it, because they think it will make them more likeable, etc. There are many helpful conversations that can come from this topic that can benefit your children for years to come! Take advantage of Financial Literacy Month this April and make a plan to start having regular discussions about money with your children. Teaching them while they're young can help them build a strong and positive relationship with money, and instill in them the value of earning money, budgeting, saving, and setting up a secure future.